Easily analyze large Microelectromechanical Systems, drastically reduce the requirements for physical fabrication, and drive down development costs. OnScale provides users with a unique set of capabilities for simulating a range of MEMS Devices such as PMUTs and CMUTs and RF resonators such as SAWs, FBARs, and SMRs. Traditionally too computationally intense for general FEA, OnScale breaks this barrier and facilitates high-level, coupled design work that was previously impossible. 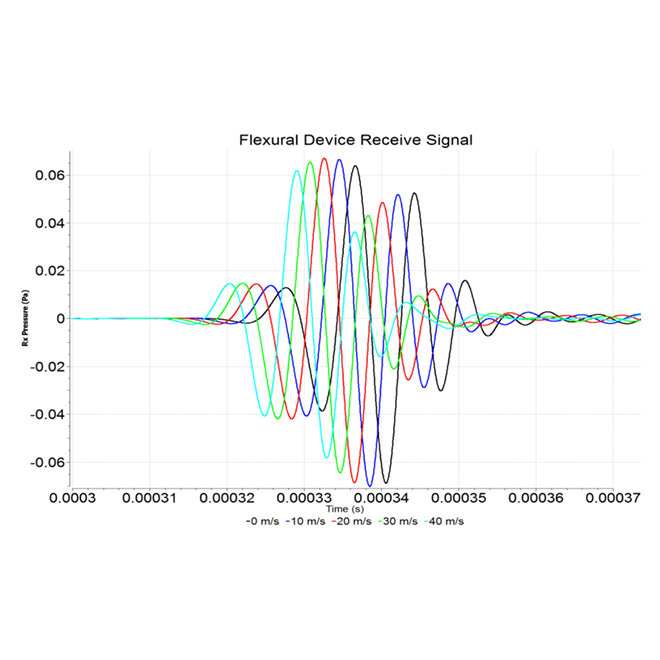 Easily extract key industry metrics such as Electrical Impedance, Phase Shifts, S-Parameters, Bandwidth, Resonance Modes, and much more. With fast and efficient up-front simulation, design engineers can slash prototype fabrication costs, expedite time to market, and reduce design risk. Include the effects of embedded circuitry on performance. 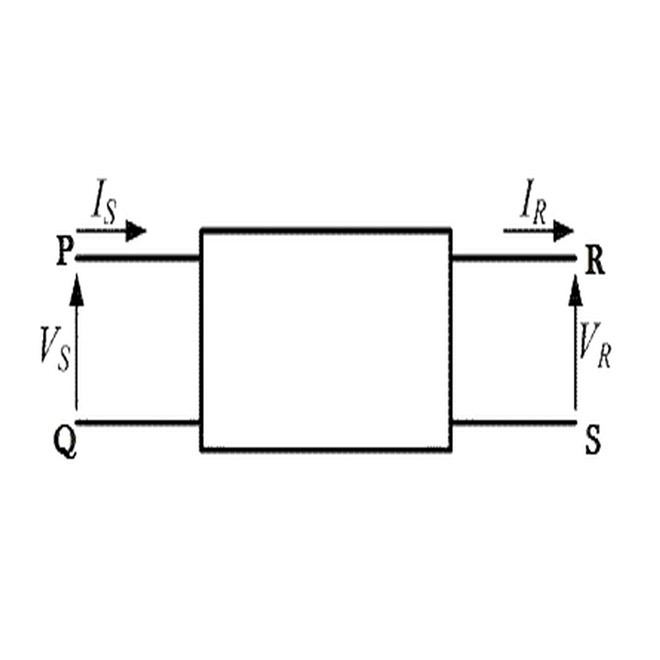 Electrical components can be connected to drive or receive electrode configurations. 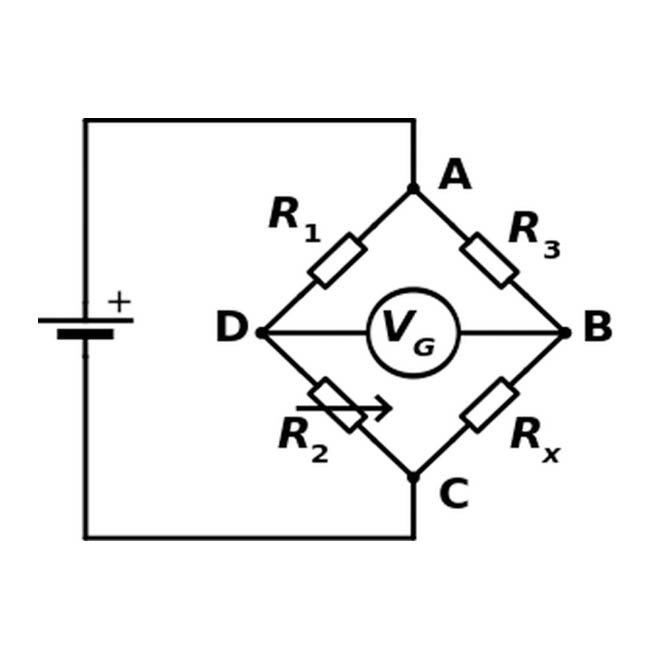 Define electrodes with arbitrary shapes and combine with novel border rings designs. Utilize non-regular shapes to enhance performance and reduce parasitic resonances. 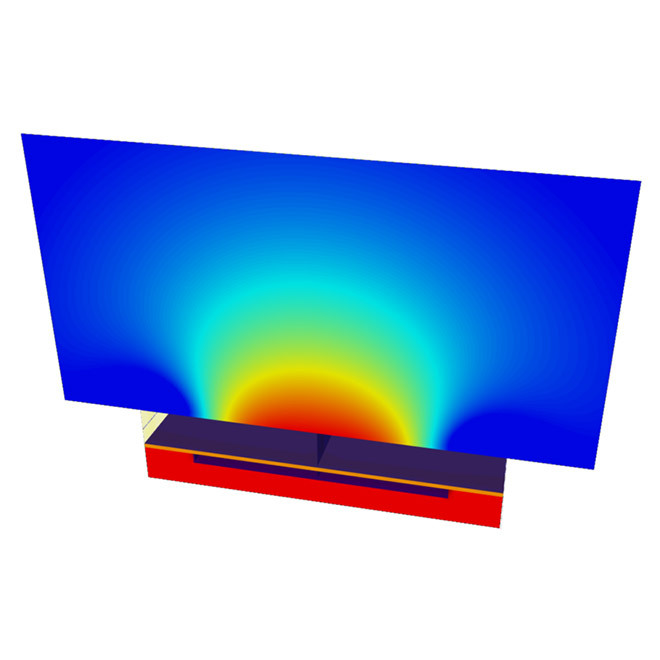 Define full mechanical, piezoelectric, and dielectric tensors to represent your materials. Supports simple transposition of properties for arbitrary cuts and symmetries. Directly extract S-parameters vs. Frequency from electrical signal information. For an N-Port network, only N-simulations are required to fully capture metrics. 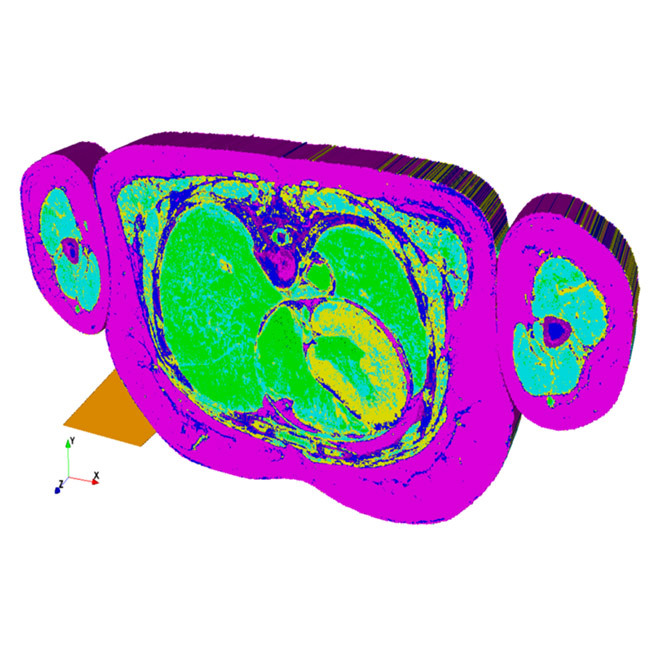 Utilize existing experimental data to run numerical optimization to extract more precise, relevant material properties for accurate simulations. Reduce approximation and fully explore your design space by modelling complete geometries. Import from CAD or other 3rd party tools to enhance workflow. 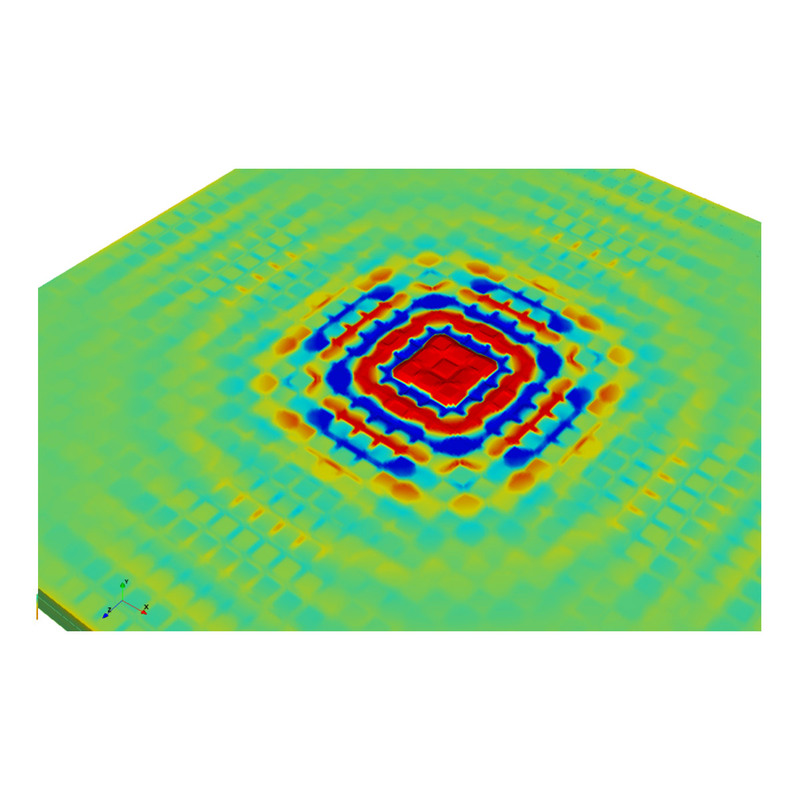 Coupled elasto-dynamic and piezoelectric effects to analyze large devices such as SAWs, FBARs, SMRs, and more. (FBARs and SMRs are forms of BAWs). Deliver results in a fraction of the time of other FEA codes to accelerate design cycles and slash cost-bases. Parallelize runs to achieve unmatched efficiencies. OnScale delivers unrivaled performance in the simulation of Ultrasonic MEMS Transducers, including PMUTs and CMUTs. Not only can OnScale allow the optimization of these devices in full-3D, which other FEA programs struggle with, but with the power of OnScale’s multiphysics solvers and cloud integration, engineers can design and simulate entire sensor arrays in their true operating environments. Get closer to your end-product than ever before and prototype with complete confidence that your sensor will meet specification. 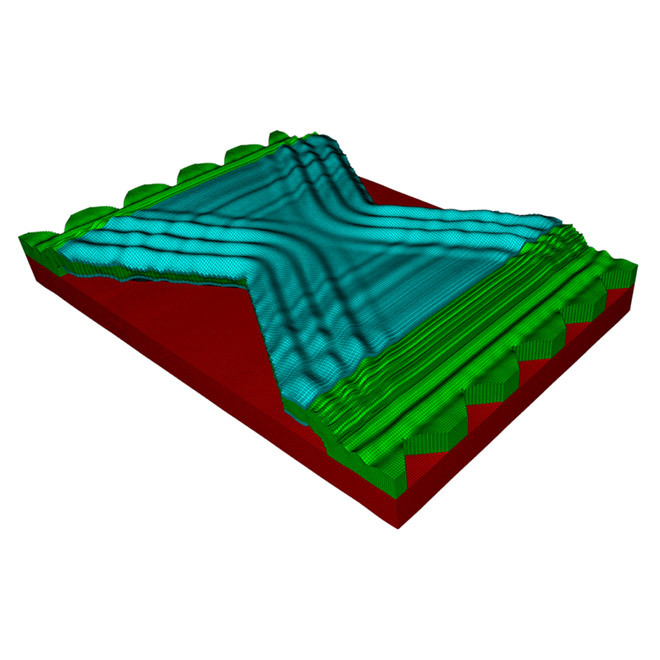 Generate membrane behavior from thin piezoelectric materials excited by arbitrary voltages. Structures can include thin passive and active layers. 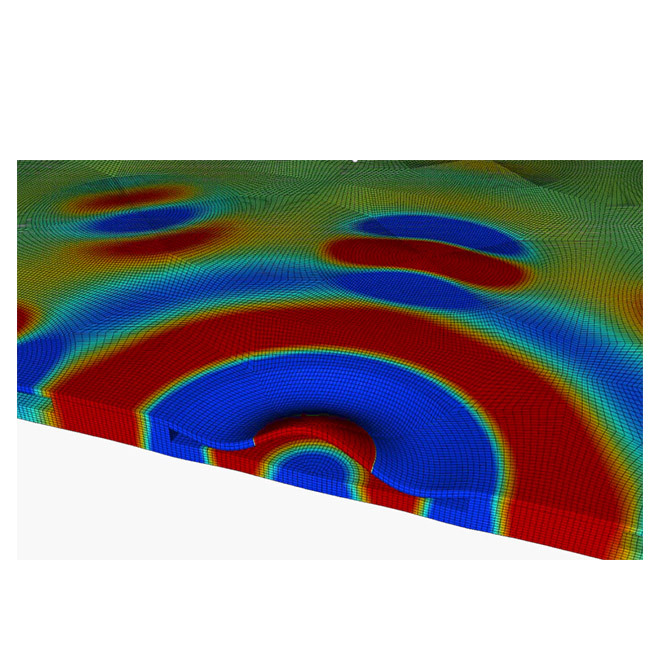 Automatic coupling of the structural mechanicals to fluid & solid loads enables users to easily explore the acoustic field properties of their devices. 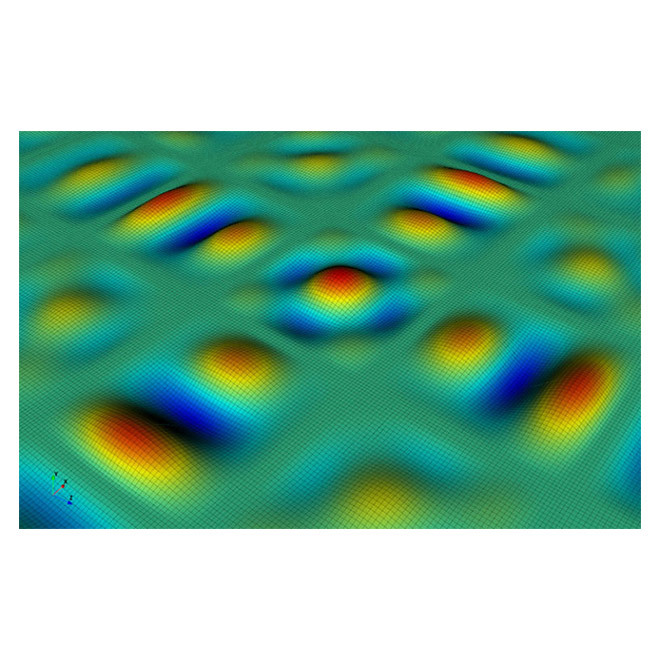 Capture membrane deformation due to electric field strength with 3D electrostatic solvers. 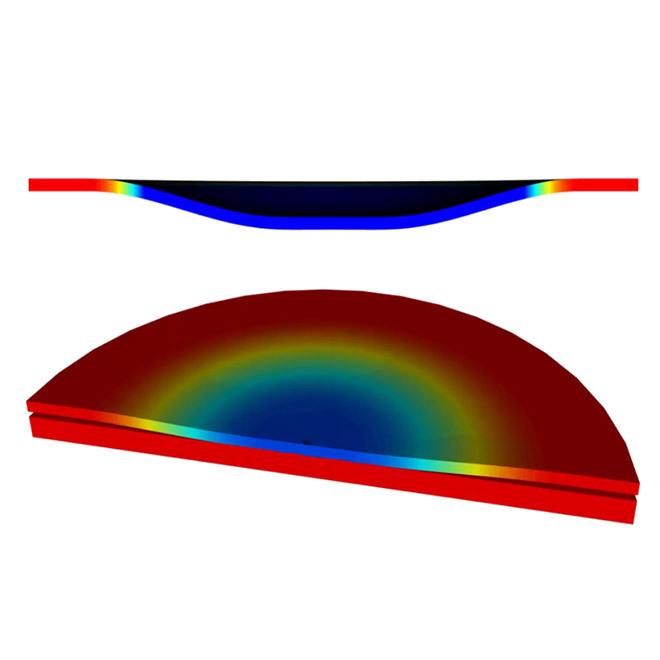 Changes in membrane position create corresponding changes in electric field strength. 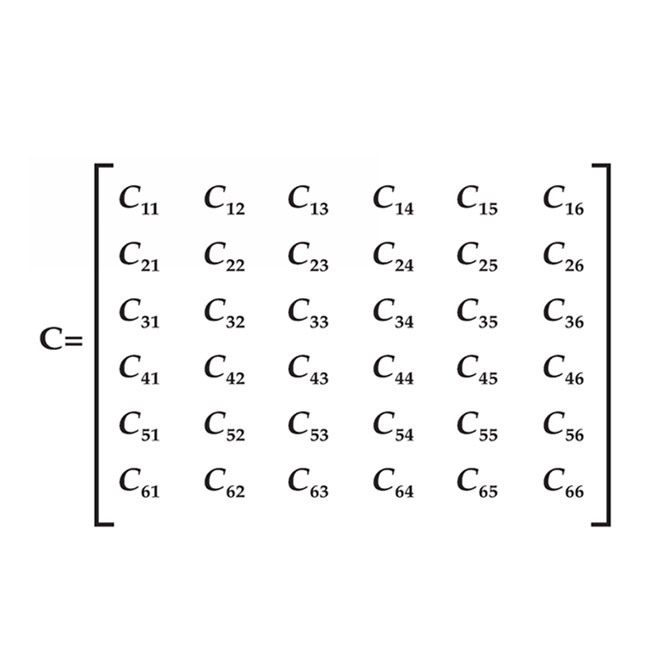 With efficient solvers it is possible to simulate multi-element arrays in a single simulation to capture cross-talk effects on overall system performance. 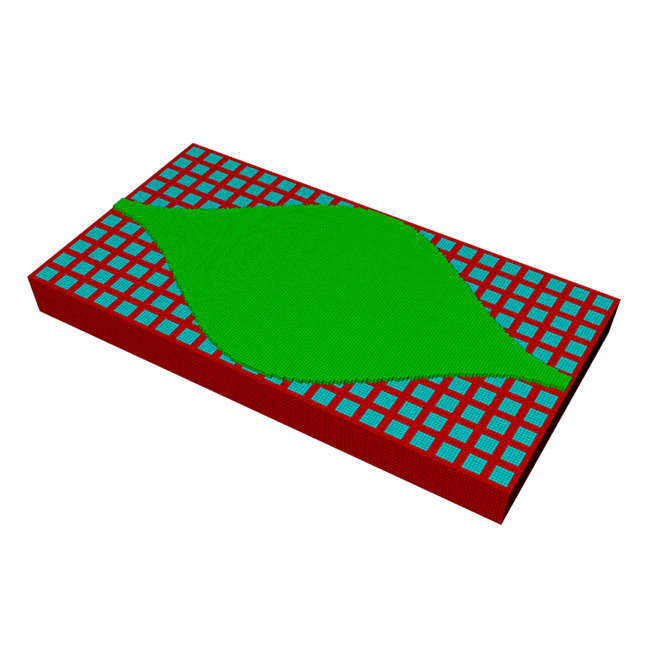 Include nonlinear geometric effects as the membrane material stiffens with deformation, and nonlinear electrostatic fields as structures are updated during simulation. 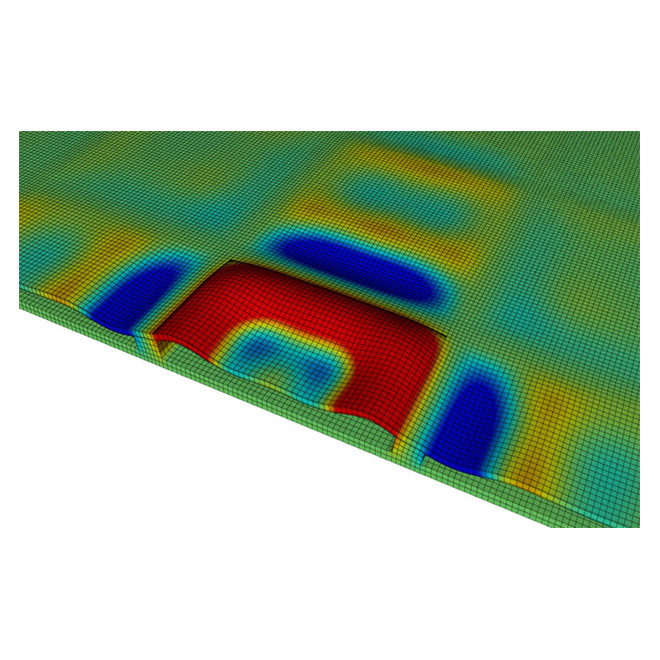 Import realistic material maps into the simulation to represent multi-layered or tissue-like load environments. 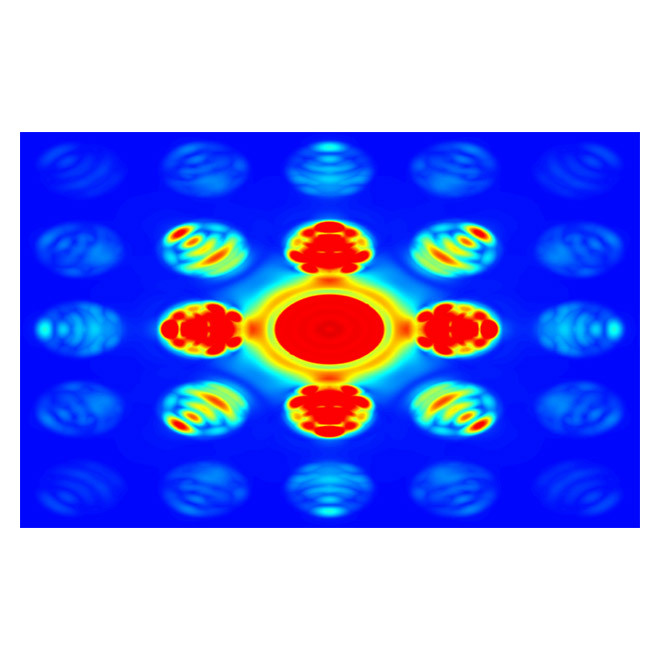 Entire system performance can be captured in a single time-domain simulation, providing unique insights into the complex coupled physics involved. Collapse-mode behavior affects resonance and efficiency of CMUT sensors. Capture these effects in the design to optimize system performance. © 2019 OnScale. All rights reserved.